Made from 100% kadhi cotton. Comes in a full range of sizes. Has pockets. Available in many colors. 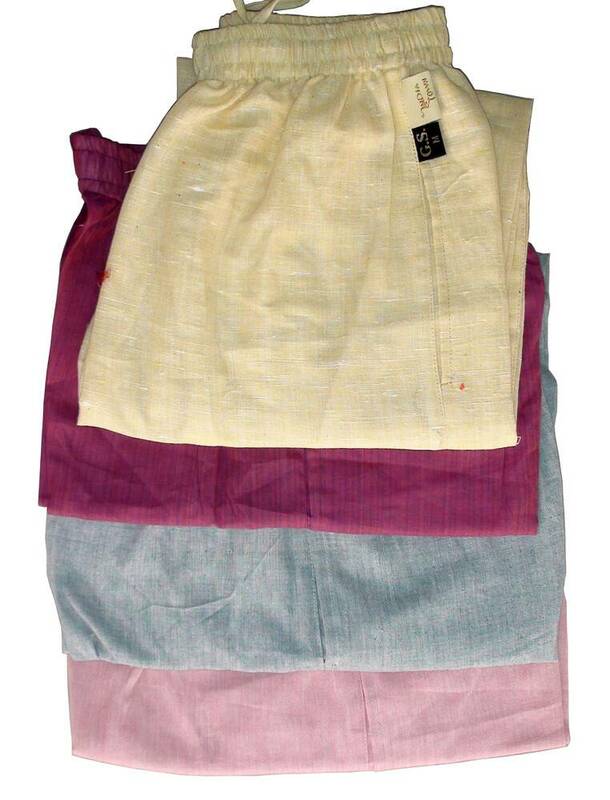 *There is one main color though Khadi clothing can have a small pattern with more than one color which is not always clearly visible from a distance. You need to note there will be some shrinkage when washing the first few times. The general rule with Vrindavan clothing is to order one size bigger than you think you need. SMALL: length 40" waist 30-40"
MEDIUM: length 42" waist 32-42"
Size LARGE: length 44" waist 34-44"
Size XL: length 44" waist 36-46"
Size XXL: length 44" waist 38-48"
The larger waist measurement here is after stretching. They are loose fitting so you can tighten up the waist so they fit over a range of waist sizes. The big waist size is the maximum they will fit. If they are too long it is very easy to shorten by folding up (making a hem) and putting in a few stitches. Question: What size would be suitable for a person with 34 inch waist?